Bless you for getting a trimpot with a knob on it that is a short, manageable size. I'm sick of having to saw down the usual kinds! It fits in a breadboard, but it's not quite "friendly". The friction of turning the knob is almost as much as the flex strength of the leads coming out the bottom. Turning the pot in a breadboard requires two hands to avoid damaging the leads. I haven't broken a lead off yet, but they got pretty bent up before I figured this out. Still, can't beat the price for those infrequently-tweaked settings. I was adjusting one of these last week and the knob came off, revealing a little slotted shaft. It goes back on easily, but revealed that this little trimpot can be used in close quarters, with a screwdriver, with or without the knob. The shaft can be set up to protrude through a hole, as well. is there any round date that these will be back? If anyone is interested I've made a tutorial on using these to control servos via an Arduino. Can this pot be used as a replacement for a project where a 100K linear pot is specified? Probably not, the range is only 1/10th of what's specified. It would be best to find a 100k linear. Check mouser or digikey, they have a LOT of options. Love this little trimmer ... perfect for prototyping. Need different values!!! Looked on the datasheet but still confused about the actual part number. Is it TSR-3386U-103T or TSR-3386U-EY5-103T? I need it so I can find other values at other vendors. It says this part is in the eagle library. What is it called in the library? 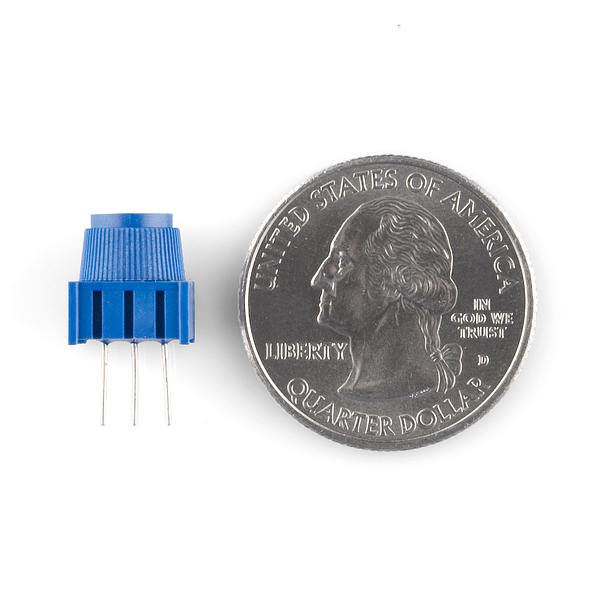 If it's "breadboard friendly" (meaning 0.1" pitch), wouldn't the EAGLE footprint be the same as the knobless 10K trimpot you've got? Why was that dumb? Yes - the same footprint should work, we just haven't checked it so be wary. 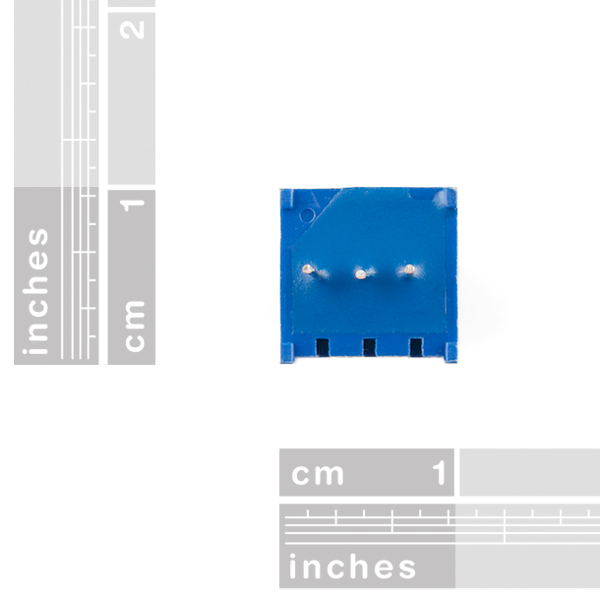 The pin footprint is the same, but the case on this one is slightly larger than the aforementioned knobless one. I just checked on one of my designs which used your 10K, this one would not fit. Scratch that. That was dumb. The 200 cycles rating is typical for trimpots with knobs. Just buy a bunch of them if they're going to be used a lot, 'cause they will wear out. 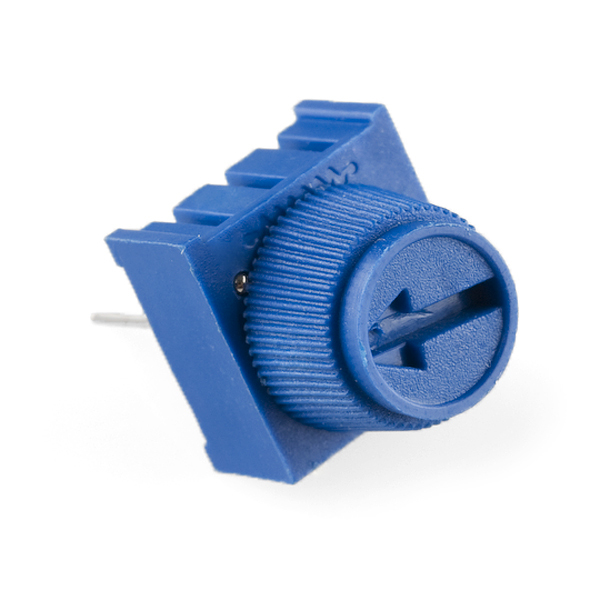 For a volume control, a more substantial panel mount potentiometer or encoder should be used. This is a good price for this type of trimpot. It would be nice if other values (e.g. 5K, 20K, 50K, 100K) were made available too. This is the kind of trim pot to throw in a tool box or a parts bin that can sit in there gathering dust until you build the prototype for your next "LCD contrast adjuster, opamp setting, or volume level" or whatever. 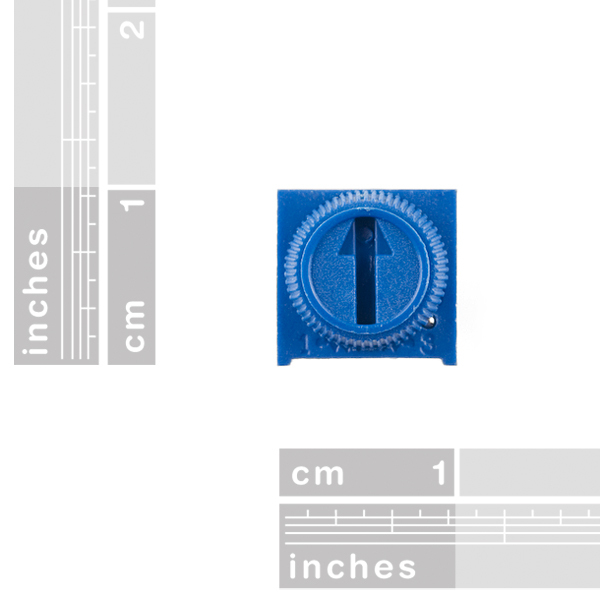 A panel mount pot or a shaft encoder is going to have a better life span, so use one of those in the final design. Or use this in a final design that might need occasional trimming. But if you are building a proto for a filter or amp for your next radio or stereo or whatever, this pot will do the job. Or use it in a final design and make it easily replaceable. Use those engineering skillz. I wasn't criticizing its legitimacy as a trimpot, but the description above includes "Perfect for your next LCD contrast adjuster, opamp setting, or volume level.". As you agree that this component is not suitable as a volume control, perhaps you'd care to edit the description. For the record, I did check the specs for a few potentiometers claimed to be suitable for volume control and the specs for a few trimpots before I wrote my original comment. I found 5-10k cycles as typical for the former and 200 as typical for the latter. Umm, the datasheet appears to specify a "rotational life" of 200 cycles. Doesn't that make the part far better suited for trimming a circuit that's adjusted rarely than it is suited for such things as volume control? It is not out of the question to create a prototype audio outputting circuit that does not require the user to adjust the volume. But, you are correct, this is probably not a part that you would use on a production device unless that device needs to be factory tuned. Fantastic for bread boarding! Comes with a knob which i have yet to find elsewhere, great for me with my fat fingers and lack of computer sized screwdrivers! Be careful when you turn it, too fast and you will break the leads!!! But as long as you are delicate with this its great! These are just the thing for breadboarding analog circuits! For a contrast control for an LCD, time or duty cycle adjustment for a simple 555 circuit, or giving a quick analog value to a digitizer like the analog inputs on an Arduino, this is quick, compact, and easy to use. Just plug it in to your breadboard and twiddle to your heart's content, no tools needed. The knob is removable if you like. Excellent product, and within acceptable tolerances. Glad you sent the Review Inquiry. It reminds me I need four more! So nice not to dig for a micro-screwdriver when I need to adjust this sucker! Handy small package works well and stays out of the way, unlike most of the pots I have had the fortune of using. I just bought a pack of 10 to not only use for my projects (because I have the crappy screw adjustment POTS) but to control the brightness of my LCD display. The knob makes it so much easier to control.